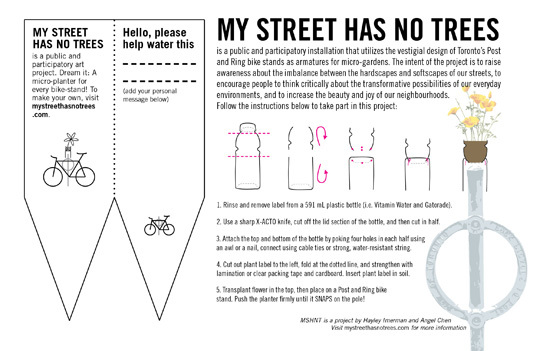 My street has no trees is not only a truth or a complaint we often hear about our cities, but also a new project run in Toronto that aims to beautify the neighborhoods, taking advantage of what the urban environment already provides. The project uses Toronto’s Post and Ring bike stands in order to create original pots where to plant micro-gardens: a recycled plastic bottle is cut and turned into a small case for flowers or vegetables, then fixed on the top of the bike stands. Reuse and reinvent are the two key words of MSHNT; the micro-gardens are made to show people the enormous potential of public space and teach us to look at the urban environment from a different point of view.In the web page of the project you can find instruction to build your own mini pot and bring some green in your neighborhood. 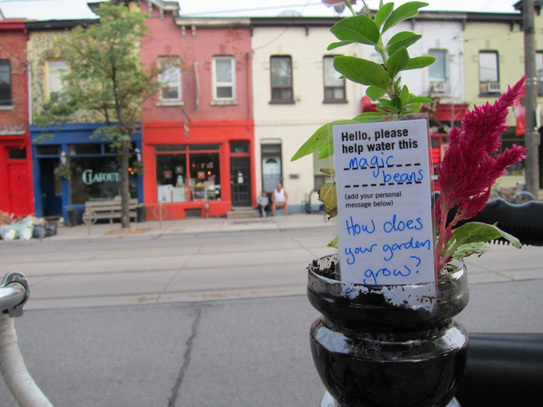 This summer 40 planters were installed in some of the main streets of Toronto. MSHNT is a public and participatory installation, an action call for everybody all around the world who want to underline the problem lack of plants and green spots in our cities. The intent of the project is to raise awareness about the imbalance between the hardscape and softscapes of our streets, to encourage people to think critically about the transformative possibilities of our everyday environments, and to increase the beauty and joy of our neighborhoods. Next time, don’t throw away a plastic bottle, it could be a small tool for starting big changes.